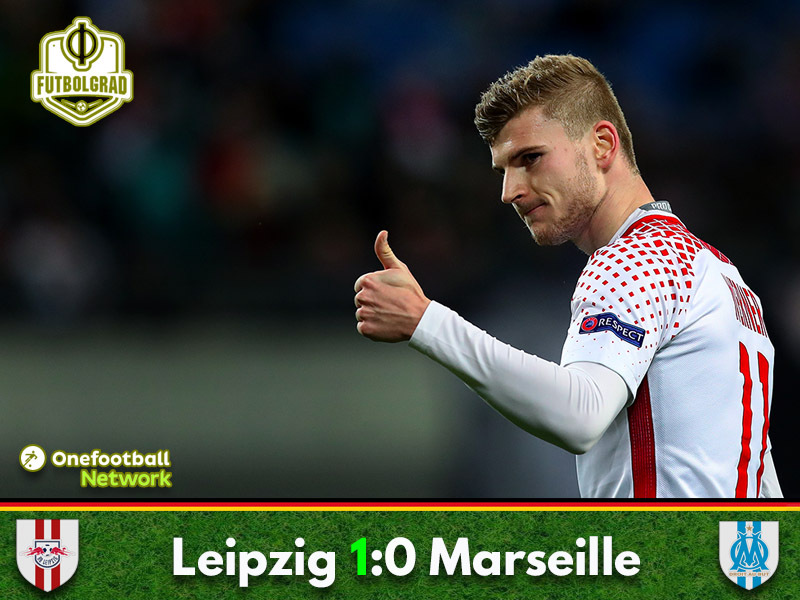 RB Leipzig vs Marseille was dominated by tactical football and thanks to a lone Timo Werner goal everything will be still left to play next week in France. Timo Werner with the game winner. Emil Forsberg wins the man of the match award. Marseille was missing several key players. It was an energetic begin by both sides with Leipzig pressing Marseille high up the pitch hoping to force mistakes by the French side. Nonetheless, it was Marseille with the first chance of the match in the eighth minute with Dimitri Payet delivering a cross to Kostas Mitroglou, who extended the ball with his backheel and Leipzig’s keeper Pater Gulacsi had to stretch himself to stop the shot. Leipzig responded by trying gain to control over the match by forcing possession football onto Marseille. 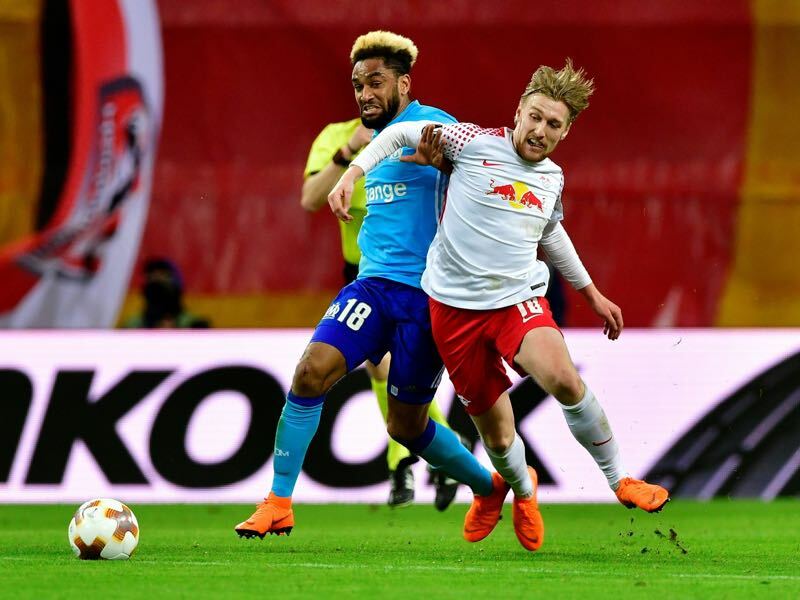 While it gave die Roten Bullen some stability defensively, it also meant that Leipzig had some trouble breaking into Marseille’s defensive third. It took until the 22nd minute for Leipzig to develop some tangible pressure. Forcing Marseille into their penalty box, Leipzig should have taken the lead when Ibrahima Konaté was left wide open after a Bruma cross, but the French defender’s header went over the crossbar. It was a highly tactical match in the first half with Marseille answering Leipzig’s Gegenpressing with a disciplined and well-schooled buildup play. On paper, the two styles should have worked well against each other. While the styles were interesting, the two sides neutralised each other in the later stages of the first half producing a game that was interesting to watch but lacked goalscoring chance until just before halftime. Bouna Sarr hit the crossbar with a spectacular side-volley in the 41st minute and Lucas Ocampos was twice denied by Gulacsi in the 45th minute. Following Ocampos’ chances Leipzig quickly countered with Emil Forsberg, the Swede played the ball forward to Timo Werner, who went one-against-one with Marseille keeper Yohann Pelé, and the German national team player made no mistake giving Leipzig the lead going into halftime. The goal gave Leipzig some much needed confidence going into the second half. Die Roten Bullen started aggressively into the second interval, which in turn allowed Marseille to counter. As a result, Ocampos (55′) and Payet (57′) had chances early on in the second half to equalise despite Leipzig’s dominant play. At this point in the game, Leipzig were fortunate to be up by a goal. Although die Roten Bullen were testing and probing trying to hit Marseille on what would be the decisive counter, it was the only significant chance Leipzig managed in the second half. The game, therefore, ended with Leipzig winning what was a very tactical match in which Marseille had the majority of the chances but was well managed by a young Leipzig side. Emil Forsberg was the Futbolgrad Network man of the match. The 26-year-old Swede has struggled much of the season with injuries but is now slowly but surely regaining his form from last season. Against Marseille Forsberg was Leipzig’s key player playing 24 accurate passes (77.4% pass completion) of which four were key passes. One of those passes created Timo Werner’s breakaway situation and ultimately allowed Leipzig to win the match and carry a 1-0 lead to Marseille. Leipzig managed their first clean sheet in the club’s short European history. Not conceiding a goal at home was the club’s main premise going into the match. But given that Marseille was missing key players Florian Thauvin, Steve Mandanda and Adil Rami die Roten Bullen may have missed an opportunity to gain a bigger advantage ahead of what will be a difficult away game in France next Thursday. Leipzig managed a clean sheet in Europe for the first time in the club’s history. Timo Werner has been involved in 53% (seven goals and two Assists) of Leipzig’s 17 goals in European competitions this season. German teams are now unbeaten in the last 13 games against French opposition.